After all the rain on Tuesday the weather on Wednesday was much better: While rather hazy and in particular in the afternoon even cloudy it was dry for the combination of an old and a new walk James How took us on. 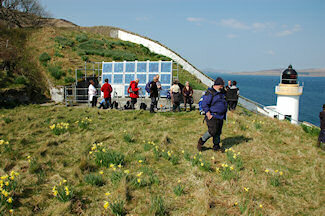 The first part was the popular walk around Ardnave Point with views of Nave Island. 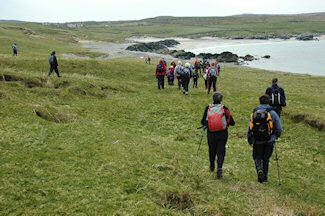 This was then extended with a walk along the coastline from Ardnave to Sanaigmore, new ground also for the regular WalkIslay walkers. A very interesting section of Islay's coast, rounded off with a cup of tea/ coffee/ hot chocolate at the new Outback Art Gallery. Thursday saw Walter Ramsay taking us from Kilchiaran, past an abandoned village, to Kilchoman distillery. At the visitors centre we enjoyed soup and sandwiches for lunch before starting the return leg: One group walked over Kilchoman Beach past Granny's Rock, another group (which included me) took the route past the swordmakers house and the old radar installations. Another walk in brilliant sunshine, the sun lotion was well worth it. Later in the evening Malcolm Ogilvie presented a very interesting slide show of Islay from the air and from the sea at the Islay Natural History Trust, quite a few walkers were in attendance as well. On Friday Tom Dunn took one of the largest walks with 51 walkers out to McArthur's Head lighthouse, stopping at Proaig for lunch. Again the weather was fantastic: After a rather cold and windy start with occasional clouds the wind calmed down considerably, it warmed up and the sky cleared completely. Several people completed a life long ambition and visited the lighthouse after so far having only seen it from the ferry. While most returned via the ‘normal’ path across the top some of us went down to the shore and explored some of the caves below the lighthouse on the way back to Proaig. 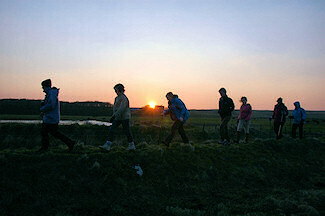 The week concluded with an evening walk led by Rory Crawford at the RSPB Loch Gruinart. While a cold wind returned for part of the walk it was a fitting end to a great week with a beautiful sunset as we were returning along the sea wall. 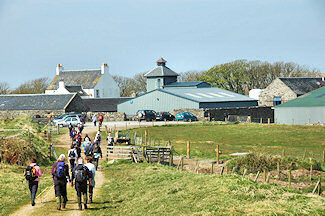 The soup, sandwiches, cakes, shortbread and hot tea (followed by the well received thank you speeches) were enjoyed by a large number of walkers. The summary of the week? 477 walks were completed by an estimated 70-80 different walkers, including visitors from the US, Germany, Singapore (or Malaysia, not entirely sure) and The Netherlands. 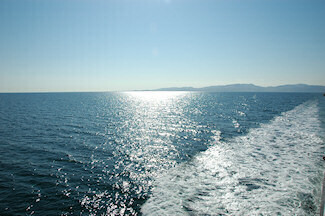 Apart from the largely wet Tuesday (which still had a pleasant dry and sunny evening) the weather has been great again. I've taken well over a thousand pictures, some of which will find their way on to the Islay Pictures photoblog over the coming days and later on to a WalkIslay 2009 travelogue. Apart from a huge thank you to all the organisers, walk leaders, participants and supporters of WalkIslay that's all I have for now. More to come from this Islay visit over the coming days.